Tender, juicy steak is an all-time favourite dish. Rare, medium or well-done, filleted or marbled, steak can be enjoyed in countless ways. 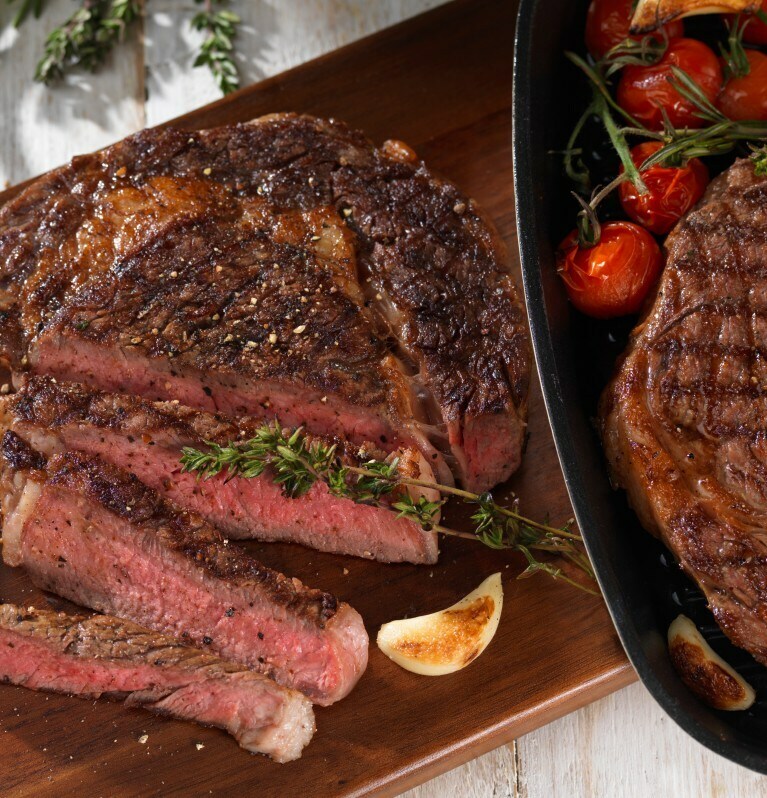 Find your favourite and follow these tips to cook the perfect melt-in-your-mouth steak. A properly prepared steak is usually at the top of the list of most people’s best-loved meals. We can never underestimate the power of a juicy, tender steak. Enjoy it with chips, salad or mashed potatoes, it doesn’t matter that much, since, once you’ve mastered these cooking tips, you’ll love it any possible way. The first step is choosing the best raw steak. Generally choose steaks that are bright cherry red in colour but remember aged steaks will have a more purplish hue. The marbling of the steak is also a very important factor – as a general rule, the more marbling, the more taste. The marble (fat) should be evenly distributed throughout the meat. Steak with little or no marbling will be more lean and tender but tends to have less flavour than that with a higher fat content. The rib is the least tender section of the three. It contains such cuts as the rib roast, back ribs and the rib-eye steak. Although these cuts are less tender they are far more flavourful than the more tender cuts you get from the short loin. From the short loin you can get the premium cuts such as T-bone, top loin steak, tenderloin and the porterhouse. Strip steaks are cut from the T-bone portion. Tenderloin provides the most tender cut of beef. This area also provides cuts such as chateaubriand, tournedos and filet mignon. These cuts are very tender but less flavourful than the cuts from the rib section. Similarly to cuts from the rib, sirloin cuts are less tender but far more flavourful. Sirloin is broken down into the top sirloin and the sirloin steak. Once unwrapped, it’s ideal to bring the steaks up to room temperature for 20-30 minutes before cooking. This ensures that the steak doesn’t cool down the oil when it’s placed in the pan and therefore ensures that the meat browns really well. Add a little oil to the pan and make sure that pan and oil are hot before you add the steak. Turn the heat up to high to seal the meat on both sides before cooking on medium heat. Let the steak rest for a few minutes on a tray or plate before serving, this allows the juices to flavour the meat. Some chefs recommend that steaks be taken off the heat and allowed to rest for 5 minutes after being sealed both sides. After resting like this, return steaks to the pan, cook to desired temperature and then remove from heat and allow to rest again for 5-8 minutes before serving. For a super juicy steak, marinate the meat for at least an hour before cooking, but don’t pierce the skin. You can trim the fat off the steak once it has cooked, but only then, as it adds flavour and helps creates a more tender steak. A great way to marinate your steak is to heat a tablespoon of olive oil in a small frying pan. Add one Continental Beef Stock Pot and stir over gentle heat for 3-4 minutes. Allow the mixture to cool for 5-10 minutes and then add lemon juice and herbs and chillies to taste. Rub the mixture firmly into the meat using your fingers. Leave to marinate for 1 hour before cooking. This tuna fish cake recipe transforms a humble tin of tuna into an ocean-fresh dinner that the whole family will love. Served with a garden salad, it’s one of those healthy tuna recipes perfect for any hot summer night. Create these easy fish cakes in just 25 minutes, a quick and healthy dinner for 4 people.